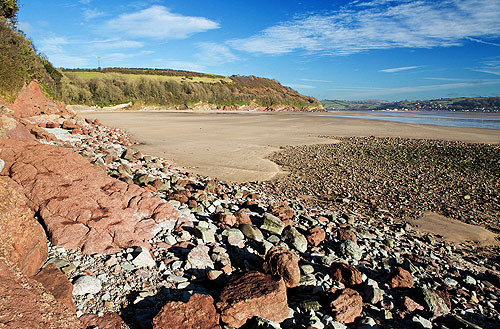 Scott's Bay is to the south west of Llansteffan , a fine beach at low tide. Calcretes (Soil Fossils) can be found in the red siltstone rocks here( 400 million years old ). When the tide comes in Scott’s Bay is ideal for swimming and bathing with little or no current . St Anthony's Cottage overlooks the bay , with St Anthony's Well nearby , hidden behind a door in the wall leading uphill passed the cottage. The water was believed to have healing properties.